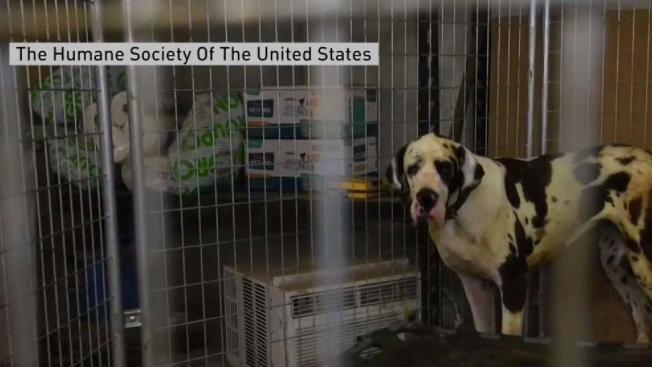 A woman who had dozens of filthy and sick Great Danes living in her New Hampshire mansion was found guilty Tuesday of 10 animal cruelty charges. Eighty-four dogs were seized from Christina Fay's Wolfeboro home in June. Authorities said the animals were living in filth and suffering from health problems. "The conditions in which these dogs were kept constitutes cruelty" under the law, Judge Charles Greenhalgh wrote. "Their cages and living areas were covered with an accumulation of feces and urine days or weeks old. The dogs had to walk in and lay down in the waste covering the floor." Fay initially was charged with 12 misdemeanor charges, but Greenhalgh dismissed two last month. In his ruling, he found the evidence showed Fay didn't provide proper care or shelter for the dogs. Messages to her lawyers weren't immediately returned. Fay is to be sentenced within 30 days. The New Hampshire chapter of The Humane Society of the United States said Greenhalgh would determine the dogs' care at that time. For now, the organization is caring for them. While Greenhalgh noted that Fay appears to have been devoted to her dogs, he also said she started having difficulty in April, when she suffered a knee injury and couldn't move about easily. She also started losing staffers and was unable to replace them. Greenhalgh said there was "a pervasive ammonia odor" in the home, so strong that veterinarians and others were unable to remain inside without taking frequent breaks. Court documents say she believed the town of Wolfeboro manufactured the allegations of animal cruelty to force her to shut down her kennels. But Greenhalgh said pictures, video and testimony from witnesses in and around Fay's home between May and June consistently show the same filthy conditions. Earlier this year, Republican Gov. Chris Sununu revamped a state commission that he hopes will help develop stronger animal cruelty laws, following developments in Fay's case.